Meeting is led by a librarian from the Kanawha County Public Library (KCPL). Meetings are held in the VIP/Community Room at Panera Bread in the Charleston Town Center Mall from 11:30 AM - 12:30 PM ET. For thirty-nine years Wendell Berry has brought us stories from the fictional town of Port William, Kentucky. The latest, Jayber Crow, is the story of a man's love for his community and his abiding and unrequited love for Mattie Chatham, a good woman who had too early made one bad mistake. Sent to an orphanage at the age of ten, Jayber grows up knowing of loneliness and want, and learns how to be a watchful observer of human goodness and frailty. With the flood of 1937 he returns to his native Port William to become the town's barber. Slowly,patiently, the observer becomes participant. Wendell Berry , Jayber Crow. Come to Claire's for a celebration of poets and farmers! This special event, presented by The Galaxy Bookshop and Claire's Restaurant, will feature area farmers reciting or reading poems from Wendell Berry's new collection, Mad Farmer Poems. *SPECIAL OFFER* The first ten customers to pre-order or purchase this book will receive a beautiful (suitable for framing) broadside print of a poem and illustration from the book, signed by Wendell Berry. 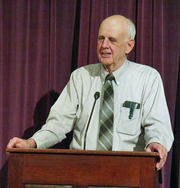 Wendell Berry is currently considered a "single author." If one or more works are by a distinct, homonymous authors, go ahead and split the author. Wendell Berry is composed of 4 names. You can examine and separate out names.